The Bagh is a heritage hotel spread over 40 acres of a 19th century garden in the Bharatpur district of Rajasthan. Located in the periphery of the Keoladeo National Park, the Bagh is at a few hours’ drive from Delhi, Jaipur, Agra and Gwalior. It offers visitors an opportunity to experience luxury near one of the most popular bird sanctuaries of India. With 38 boutique rooms, the hotel's grounds are dotted with beautiful flora and fauna. While the bird sanctuary is 10 minutes away, you can spot over a dozen species without even having to leave your room. Blending in elements of modern comfort in a nature retreat, the Bagh offers a dining room, an all-day multi-cuisine restaurant, a well-stocked bar, a spa and sauna facility, and recreational activities for guests of all ages. One side of the hotel is surrounded by organic farms and luscious greens – the Farm Wing. It has lawns and open courtyards to sit in and enjoy the surrounding nature. 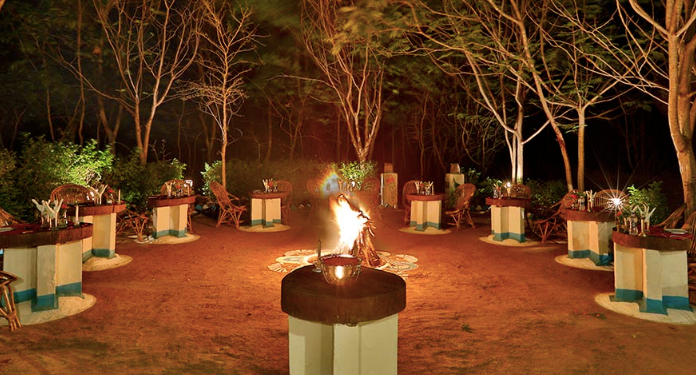 The Bagh Resort is a forest retreat in the heart of central India. It is located just 15 minutes away from the Mukki Gate of Kanha National Park - one of the largest tiger reserves in India. A small mud hut, painted in earthy colours and lit with lanterns, invites you into the expanse of the Bagh, which is spread over 20 acres of land. There are over 20,000 fruit and flowering trees spread across the resort’s grounds surrounding the 26 rooms, 16 deluxe cottages and 8 junior suites. All the rooms have terraces that open towards the garden and the lake. Guests can enjoy escorted tours of the national park and witness Indian wildlife first hand with our experienced naturalists.